Corizus hyoscyami is a very weird bug indeed. 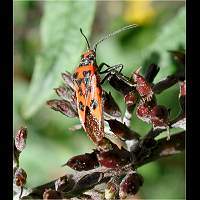 It is extremely similar to the Firebug and is often mistaken for one. The two species however are not closely related at all. 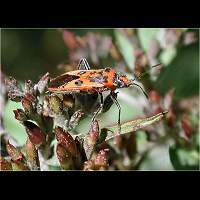 Corizus hyoscyami belongs to a very small bug family called the Rhopalids (Rhopalidae). The members of this family all have a small glass like transparent section in the shieldy parts of their wings. These transparant sections are called windows. 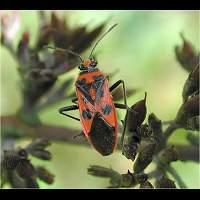 In Corizus hyoscyami however the windows are black and not transparent. The differences with the similar Firebug are easy to see. The markings on the Firebug are different, the snout is entirely black and it can't fly. The Firebug and a few of its relatives are not the only look-alikes. There are also a number of similar Seed Bugs. Many of these have a white dot on the membranous parts of the wings. Anyway, alwys pay close attention to shape and number of markings when identifying red and black bugs. 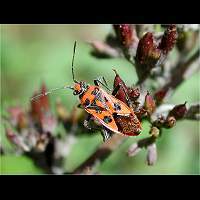 You could also use your nose, for Corizus hyoscyami smells like cinnamon, that is why it is called the Cinnamon Bug in Dutch. The animal reaches a length of some 9 to 12 mm. Adults mate in May or June. Females lay their eggs in June and July. The larvae are seen from June to the end of August. They are nothing like their parents. The basic colour is yellwoish green and they show a lot of red spots. They are extremely hairy as well. The adults of the new generation appear in September. In autumn they hide between leaflitter and overwinter. 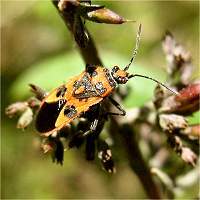 Corizus hyoscyami is common in southern parts of Engeland only, but is rapidly spreading northwards. Not found in Wales, Ireland or Scotland. It prefers light sandy soil. Very common on the continent and appearing as northern as Finland.